The DWE315K features a powerful 3.0 Amp motor which provides strong performance for cutting and sanding. The Quick-Change Accessory System allows blades and attachments to be changed quickly without wrenches while the Dual-Grip Variable Speed Trigger gives users ultimate speed and application control. Its bright LED light illuminates dark work surfaces for accurate cutting. 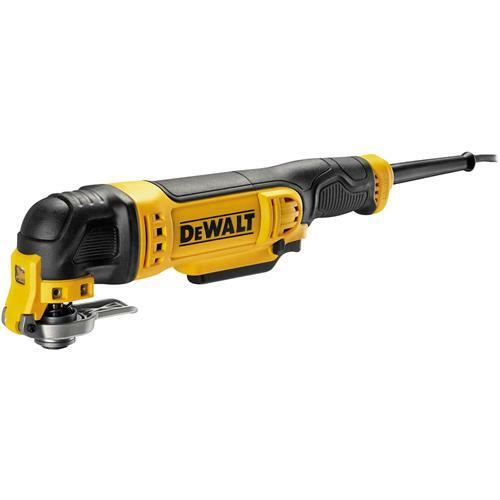 This device comes complete with a DeWalt Oscillating Tool Guide System allowing users to set the depth or height for accurate repeatability. The 29-piece DeWalt kit with storage box includes popular cutting and sanding attachments and the multi-brand accessory adaptor allows for use with most oscillating tool accessory brands.